Hi Friends of St Brigid Press! We're rolling along in our production of our new chapbook, Reverie, which launches next Sunday the 20th at Black Swan Books (3pm to 5pm, if you're in the neighborhood!). At the moment, we are enjoying illustrating the pages with original nature prints from the grasses that grow in the meadow at the Press. Here's a sneak peek at today's print process, working with the lovely little meadow flower, Pennsylvania Bittercress. Just last week, our field began to bloom with the tiny white petals of Cardamine pensylvanica, Pennsylvania Bittercress. We decided the Bittercress would make a delightful accompaniment to the first poem in the book. 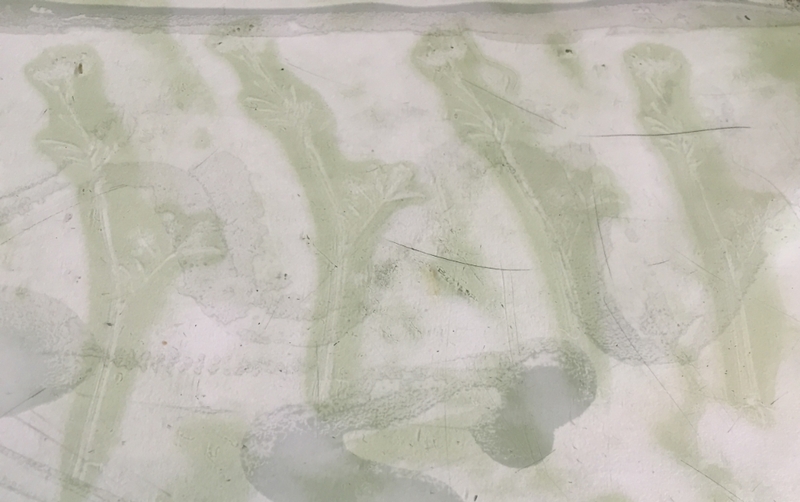 Next we hand-mixed a sweet spring green color, gently pressed the Bittercress into the ink, and carefully transferred the inked cutting to the page of poetry. Lifting off the Bittercress, reveals its subtle image. Next up: clover and wild onion! If you can't make it to the look launch on March 20th, but are interested in purchasing this limited edition book, please see HERE.